My newphew, Keller, had is first birthday party this weekend! Here are just a few of the 382 pictures I took on Saturday. 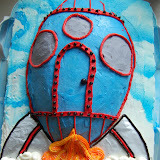 The rocket cake in the picture was made by yours truly. I was pretty happy with the end result. I have to tell ya though, picking a handful of pictures from all of the adorable shots of sweet baby Keller was difficult, he's just so precious I could eat him up! Anywho, here's a summary of Mr. Keller's very first birthday celebration. Great Rocket Cake!! I can't believe a YEAR has passed already!